Access all available Santa Fe real estate listings below! The city of Santa Fe is located in the north-central area of New Mexico, nestled within the Sangre de Cristo Mountains, at nearly 7,200 feet above sea level. Santa Fe is the capital of New Mexico as well as the oldest capital city in the United States. As such, this naturally beautiful region has a vibrant past and rich culture that continues to have an influence on both the city and the roughly 70,000 people who call it home. With a favorable economy, easy access to outdoor recreation, great schools, a thriving arts and culture scene, and a wide range of housing options, it’s no wonder people are choosing Santa Fe real estate. Start browsing the Santa Fe properties listed below or learn more about Santa Fe homes for sale! 1,652 Properties Found. Page 1 of 138. Be the first to see Santa Fe real estate listings & gain access to advanced search tools. Register with Santa Fe Properties to get started! Santa Fe real estate is as diverse as the city itself. Property types include everything from condos and single-family homes to ranches and sprawling estates. 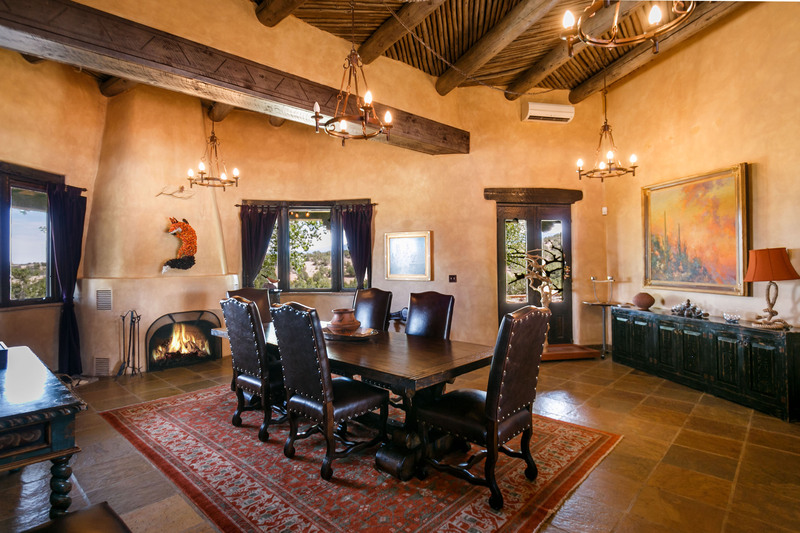 Ranging in price from under $100,000 to upwards of $15,000,000, prospective buyers are sure to find a Santa Fe property perfectly suited to their budget and lifestyle. Santa Fe homes for sale are found throughout many residential neighborhoods and districts, each with their own unique charms and history. This is evident in the various architectural styles found throughout the city, which include Pueblo Style, Greek Revival, Queen Anne, and Arts and Crafts bungalows. Architecture of Santa Fe Homes: The "Santa Fe Style"
Architecture in Santa Fe is steeped in history and culture and as such, it has become an important aspect of the city. Influenced by different cultures and eras, including the indigenous Pueblo people, and Spanish Colonial and Mexican periods, the distinctive architectural "Santa Fe Style" was born. 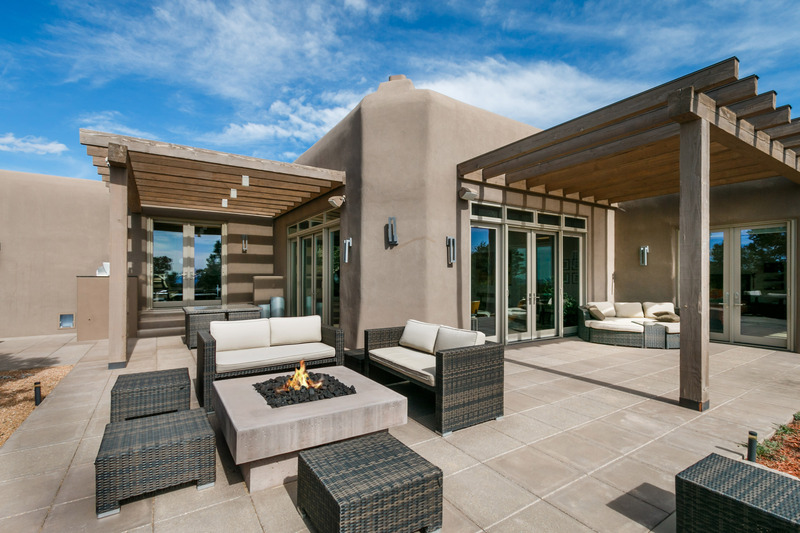 Recognizable elements of Santa Fe properties include adobe and stucco exteriors with natural earth tones, flat roofs, colorful doors, and coyote fences. New homes and buildings in Santa Fe include many of these features, combined with contemporary design elements, successfully weaving the old with the new. 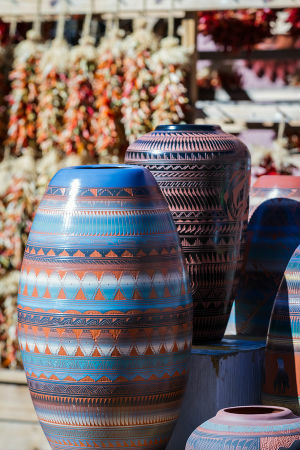 Living in Santa Fe provides plenty of opportunities for people of all ages and stages of life, offering Northern New Mexico's finest in art, entertainment, and more. It's no secret that the city has a thriving arts and culture scene. In fact, Santa Fe is the third largest art market in the United States, attracting locals, tourists and international collectors alike. Santa Fe is similarly known for its rich history, spanning back thousands of years. As such, there are plenty of museums and historical sites in the area. Shopping and trade in Santa Fe also dates back thousands of years and includes a diversity seldom found in other cities. Similarly diverse are the restaurants and eateries found in Santa Fe, though it's most famous for its New Mexican cuisine featuring green chile peppers. Interested in Santa Fe homes for sale? If you have any questions at all about Santa Fe or the surrounding New Mexico area, please don't hesitate to call us at 1-505-982-4466 or send us a message. We're here to help you with all of your Santa Fe real estate needs.